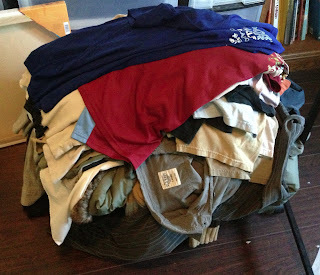 My husband has exactly seven T-shirts in his drawer today. Yesterday he gave me permission remove all the blood from his wardrobe. If I had done the job right he would be down to two pairs of Thai style MC Hammer pants and a couple light, gauzy, mandala, hippie shirts. I left him enough for one week. Evidently dressing ethically is a much more difficult task for a man. As I sadly placed each of his concert shirts on the burn pile, I noted that every single one of them was Anvil or Gildan. Since I made a commitment NOT to go broke replacing our wardrobes he will have to get by with less for a while. He seems pretty cheerful about it all so far but I wonder how he will feel when he goes to reach for a shirt and finds they are all dirty because we can no longer go two weeks without doing laundry. I had my first clothing diva "freak out" the other night since starting this project. I was happily cooking my family sloppy joe's for dinner when I flicked the stir spoon in just the wrong way and drenched my t-shirt in hot hamburger grease. I screamed several obscenities, started crying and ran to my bedroom like a seven year old. The fact that the grease burned me was not the reason for my distress. My hysteria was over the fact that I had destroyed one of the two t-shirts left in my closet. I had just bought it at a fair trade shop in the local village near our home. In my hysteria I threw it in the trash dramatically. My sweet husband then jumped up and googled online instructions for how to get grease out of cloth. He put some dish soap on it and soaked it over night in the sink which did the trick. Thank you Honey!!! As I reflect on my tantrum I can't help but realize that if Justin had not taken the shirt out of the trash it would probably still be there. I generally would not throw clothing in the trash if it were not stained but in those cases I use the alternative; Goodwill. 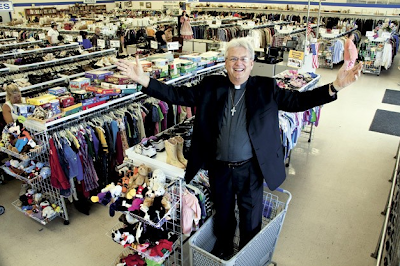 I have been shopping at Goodwill and feeling "good" about it for my entire life. I was raised to look for the best deal and where else can I find name brand clothing for $5? I also get to feel good about helping the less fortunate and write it off my taxes. Sounds like a win/win to me! Goodwill Industries was founded in 1902 by the Rev. Edgar James Helms, a Methodist minister who came to the head of a Unitarian Church in Boston's South End slums. Under Helms, the chapel was transformed from a shelter for alcoholics looking for a hot meal into an experiment in social reform. He installed pipes under the baptistry to create showers in the basement and made space for a nursery for working mothers. Eventually he appealed for used clothing in order to give poverty-stricken seamstresses work before selling the clothing back to the needy. 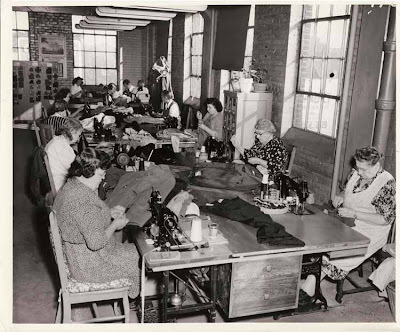 By 1919 Goodwill Industries had shops and training centers in four states with plans for thirty more. At that time they were also able to tap an entirely new labor market; disabled veterans from WWI. In 1951, at the age of forty-nine with 101 plants in the United States, Goodwill Industries took in $13.6 million in revenue and paid $8.2 million in wages. Fast forward to September, 2012 where in an article written by John Hrabe, it was revealed that Goodwill Industries is nothing more then a "charity racket". He explained how Goodwill has been able to exploit their disabled employees thanks to a Depression-era loophole in the federal labor law. New calculations have shown that many disabled workers are paid as little as 22 cents per hour. "Subminimum wage, as enforced by Section 14(c) of the Fair Labor Standards Act of 1938, is wrong because it creates a double standard for how employees, particularly employees with disabilities, should be paid, by offering 'special wage certificates,'" points out Andy Voss, president of the Autistic Self Advocacy Network of Sacramento, which organized a protest outside of a Sacramento Goodwill store in August (pictured below). "It is appalling that organizations that purport to assist workers with disabilities in job training, would hold them back by circumventing the standard of living that minimum wage provides other American workers." But Hrabes expose did not stop at shameful labor practices. He went on to reveal that Goodwill executives in Florida and California earned from $200,000 - $500,000 in 2010. And just a reminder here, as a charity, Goodwill pays no taxes. Further, in 2005, in my very own city of Portland, Oregon it was revealed that the president of Portland's Goodwill had earned $831,508 the previous year. He was subsequently called out by a state audit, at which time he agreed to reduce his earnings by 24%. Before he was caught, Miller's earnings ranked him in the top 1/2 percent of all American wage earners. I learned about these stories only recently, after I decided to have the bonfire. I was quite upset to know that I had made a lot of fat cats a whole lot fatter by donating my clothing out of the "goodness" of my heart. I had no idea that I was exploiting the disabled men and women of this country by doing so. Sadly, I realized that my beloved Goodwill habit was no better than my Target habit. I thought about how much money I personally spent during the Occupy movement here in Portland buying coats and blankets for cold occupiers. It turns out that as I was screaming in the streets about the 99%, I was putting money right into the pocket of the 1% to sustain the movement. This is what raw, lustful, greed looks like.